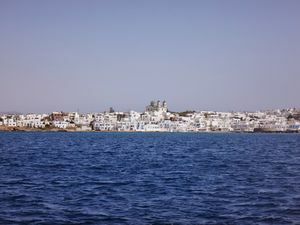 Paros is a major island of the Cyclades group and is frequented by summer tourists heading toward Ios and Santorini. Paros is considered as one of the most beautiful islands of the Cyclades. It is characterized by the many beaches and also the charming villages. Paros' main communities are Parikia and Naoussa (Paros island). Parikia is the island's port town and capital. 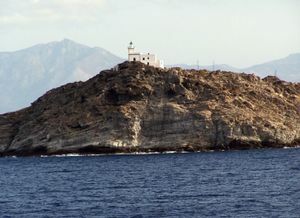 Other small communities include Lefkes, Marpissa, Piso Livadi, Drios and Aliki. The climate of Paros is characterized by hot, dry summers and mild winters. Like in most of the Aegean islands it hardly ever rains during summer but rain showers can be expected between October and April. Temperatures in July and August range from 30ºC (86ºF) during the day to 22ºC (72ºF) at night. The Cyclades are famous for the constant wind (called meltemi) in July and August that mitigates the heat a bit. In the whole period mid-May through mid-October it's usually warm and sunny enough to enjoy the beaches. In Paros most of the population can speak English except the older generation. In many bars, pubs, restaurants and shops there is somebody who speaks English, Italian, or German. View of Naousa from the ferry to Ag. Ionnis. Ferries and highspeed catamaran services  run daily from Piraeus, Cyclades and Heraklion - Crete island. The highspeeds take half the time but cost twice as much. The ferry landing is haunted by dozens of room-hawkers, and is manic. If you arrive during a high wind and/or at night, it can all be a bit overwhelming. Know where you're going, book ahead or turn right and head for the nearby bus terminal to the right of the ferry terminal exit for regular bus shuttles across the island. There are daily air services from Athens and Thessaloniki only. Olympic Air is the main carrier, but there are also flights by Sky Express. Bus services  operate between the towns with very frequent departures in season. The main bus station is in Parikia, very near the port. The second hub is Naousa. There are five lines well distributed to cover every part of the island. It is possible to buy your bus ticket from the bus driver (have exact change ready), but you can also buy your bus tickets before boarding the bus. Tickets are sold at Parikia and Naousa Terminal Stations and also in selected stores, mini markets and kiosks that have the special sign in Parikia, Naousa, Lefkes, Prodromos, Marmara, Marpisa, Piso Livadi, Drios, Aliki, Punda, Voutakos and Antiparos. One way ticket price is €1.80; a bit more for longer distances. Price for a daily ticket for all lines is €9. Car hire is readily available in all towns and is relatively cheap out of the season. Also, there is possibility for rental motorbikes, ATVs or bicycles. ParosEuropeanRent cars & motorbikes rental  is located in Parikia. ML motorland cars & motorbikes rental  is located in Naoussa. Don't miss the church of Panagia Ekatontapiliani which means the church of 100 doors , in Parikia (very close to the harbour) a 4th century monument, rebuilt after the earthquake of 1773. The original church was built by St. Helen , the mother of St. Constantine, according to the legend . The old town of Parikia is considered to be the biggest in the Cyclades island. You will find alleys untouched from the touristic wave that reduces the beauty of these settlements. Lefkes village is in the middle of the island with many nice tavernas, and beautiful alleys. From Lefkes you can take a very nice walk at the old stones of the Byzantine Route down to Prodromos. In front of the port of Naoussa is situated the unique Venetian castle of the 15th century, built during the dynasty of Sommaripa. As it is half-sunken beneath the surface of the sea remains a remarkable sight. In Parikia's seafront, you will find many nice tavernas with excellent food, exactly behind in the old town wander along the narrow streets with the many kinds of shops, and the unique Cycladic atmosphere. Don't forget to seat in one of the many "Ouzeri" in Naoussa and taste Gouna fish and octopus in vinegar. Paros has a very good fresh cheese named Myzithra: perfect with oregano, olive oil and small tomatoes. Entropy Bar; on Lower Market Street serves up drinks & disorder nightly - and boasts one of the most creative & eclectic cocktails & special shots on the island and has Happy Hour every night. Jazz Bar on Market St in Parikia; serves a great Martini! Pandrossos Hotel;popular place to watch the famous sunsets is the windmill bar. Pebbles jazz bar; favourite bar to watch the world go by on the south harbour promenade. Resalto bar; very nice bar in the port of Drios, plays the best rock music in Paros. Pirates bar; in the narrow roads of the Market of Paroikia plays the best jazz music and offers a great lounge environment! Alexandros Cafe; unique cafe in an old windmill, nowadays a cafe with magnificent view to the traditional settlement of Parikia and the sunset. The main night life destination is the quaint town of Naoussa where you can enjoy a meal by the sea before following the music to bar street within the old city or along the main prominade. There is a great selection of pensions, hotels, villa rentals and one youth hostel on Paros to choose from. Ampeli Studios Family run studios located in Parikia close to the beach and the port. Anna Platanou Parikia +30(22840)21751 mobile +30 694 718 8610 mailto:[email protected] http://www.annaplatanou.gr This is a friendly family run accommodation offering rooms and apartments in Parikia close to the beach and the old town with sea view. Very nice and helpful owners. Dryades Gardens & Studios Drios phone +30(22840)41422 mobile +30 694 848 0564. Located in the seaside village of Drios, these studio apartments operated by a young Greek-American family offer a clean, comfortable accommodation away from the crowds. All studios are equipped with a kitchenette, WC, air-conditioning, TV and a private balcony or terrace with an unobstructed ocean view. The 4 acre property is landscaped with a wide variety of flowers and fruit trees. Ragoussis House  - traditional Cycladic rooms, studios and apartments located on a small hill between the Logaras beach and Pounda Beach. The Athens-based owners are very helpful, and offer transfer to the hotel from both the port and the airport. Kallisti Paros hotels  is 400 meters from the center of Naoussa, overlooking the Aegean. Archipelagos Resort hotel  is a 5-star hotel on the west coast of the island at the beach of Agia Eirini. Paros Villas Rentals  is a villa rental agency with an extensive selection of villas, vacation homes & holiday rentals and also offers Paros Yacht Charters and additional local services. Paros is generally a safe island. Be aware of rental scams, especially with agencies working only with motorbikes and ATVs. Using these types of vehicles is very common on Paros and there are a lot of rental agencies. Some of them are ready to cheat. They will offer faulty motorbikes or ATVs for a lower price, but in case of accident they will demand that the customer pay for the whole cost of damage. They are offering only basic insurance but will present it like full insurance. Also, there is a big possibility of serious injuries. Move on by boat to Antiparos, Naxos, Mykonos, Syros, Ios or Santorini. Another way to discover Cyclades islands is by a private sailing boat. There are various companies that offer sailing trips in the Cyclades, most of them from Paros or Syros island. Greek Water Yachts private sailing trips & boat charter  is located in Paroikia, the capital of Paros. Michael Zeppos  is located in Naoussa, a picturesque village of Paros. This page was last edited on 9 March 2019, at 07:37.